For generations, Bostonians have used the dome of the State House to find their way to Beacon Hill, to symbolize their city, and to mark the center of the "Hub of the Solar System." But the shining landmark we love today hasn’t always gleamed with gold. In fact, it started out as a leaky wooden roof. When up-and-coming Boston architect Charles Bulfinch took on the job of planning the State House, it was his first paid commission. He based his design on neoclassical elements: columns, a pediment, and a vast shingled dome intended to make the structure stand out among its squat, square neighbors. When construction was finished in 1798, the State House was the most architecturally important public building in the young country, the first answer to the question of what an American government building should look like. Boston’s grandest building, perched atop its highest hill, became an instant monument. Unfortunately, Bulfinch’s grand achievement couldn’t quite stand up to New England weather. The impressive 30-foot-high dome began to leak almost immediately. After just 4 years, enough rain and snow had seeped in that the wooden shingles were beginning to rot here and there. A hero of the Revolution was called in to save the day. Paul Revere’s foundry was hired to make the dome watertight by sheathing it with a thick layer of copper (thus creating what may be the world’s largest piece of Revereware). The new copper top was painted the dark grey of lead at first. Soon after — although no one is sure exactly when — the dome became "golden" for the first time. Boston guidebooks from the 1820s refer to the dome as yellow or bronze; we know those accounts are accurate, because during the most recent State House renovation, contractors who peeled away old paint on the dome discovered multiple coats of pale yellow paint. In 1831, though, the dome returned to its earlier leaden grey, and it remained that color for more than 40 years. The person most responsible for the State House dome as we know it today is Nathaniel P. Banks, Governor of Massachusetts from 1858 to 1861. Banks dreamed of making the State House a magnificent landmark, something befitting the old description of Boston as "a shining city on a hill." He spoke about it often during his term as governor — persuasively, as it turned out, although the Civil War intervened. In 1874, the dome was gilded for the first time with 23.5 karat gold leaf. In the nearly 130 years since then, the State House’s golden dome has dimmed only once: during World War II, when it was painted a dull grey to hide the glimmer of gold from any enemy ships in Boston Harbor that might have wanted to use it to aim their weapons. It was regilded in 1947 and has been the jewel of Boston’s skyline ever since. 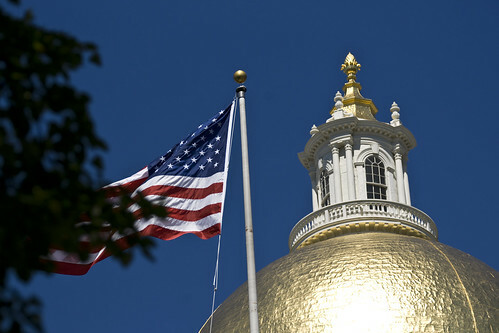 To keep its characteristic brilliance, the State House dome gets a fresh coat of gold leaf every 25 to 30 years. The most recent gilding took place over four months in 1997. The first and most time-consuming step of the four-month process was the design and construction of the scaffolding surrounding the dome. The structure was carefully engineered to touch the dome as little as possible, both to leave room for the work and to keep as much weight off the dome as possible. After the scaffold was complete, a team of experienced craftspeople cleaned the surface of the dome. Using a commercial paint stripping agent, they removed the old gilding and primer to reveal the bare copper underneath. A coat of fresh primer went over the copper. Once the primer was dry, the crew began to coat small sections with a layer of "sizing," a liquid that dries to a tacky finish to hold the gold leaf. As each section dried, they then applied sheets of gold leaf in 3-inch squares trimmed off a larger roll. Gold leaf is just five-millionths of an inch thick — so thin that direct light almost shines through it. It melts when touched; the slightest movement of air will wrinkle it. Despite a canvas scrim draped over the scaffold to cut the wind, a cloud of golden flakes whirled down Beacon Street almost every day until the project was complete. In fact, so much gold leaf blew away that the contractor had to order more in order to complete the project! When the dome was first gilded in 1874, it cost $2862.50 — approximately $44,000 in today’s dollars. By comparison, the 1997 re-gilding cost $300,000. Highway signs indicating the distance to Boston aren’t measuring the miles to the city limits, but to the State House dome. The dome is 50 feet in diameter and 30 feet high. The inside of the dome rises 50 feet above the floor. The original wooden ribs and planks of the dome still exist between the copper sheathing and an inner layer of plaster added later for fireproofing. They still hold up the roof, with help from steel beams added in the 1890s. The copper sheathing itself is in remarkably good shape for its age; much of it is the original copper from Paul Revere’s foundry. During the 1997 renovations, contractors needed to make only a few minor repairs. The cupola atop the dome was replaced in 1859 with a new, and noticeably larger, structure. Bostonians hated it so much that it was replaced again in 1897 with a replica of the original. The cupola is crowned by a pine cone symbolizing the importance of the lumber industry to the early New England economy. The wood for the State House came from the northernmost part of Massachusetts, which in 1820 split off to become the state of Maine. When the State House originally opened, it was possible to climb up to the cupola via two flights of stairs, each 170 steps high. Background for this article was provided by the Architecture and Planning firm, Goody, Clancy and Associates.